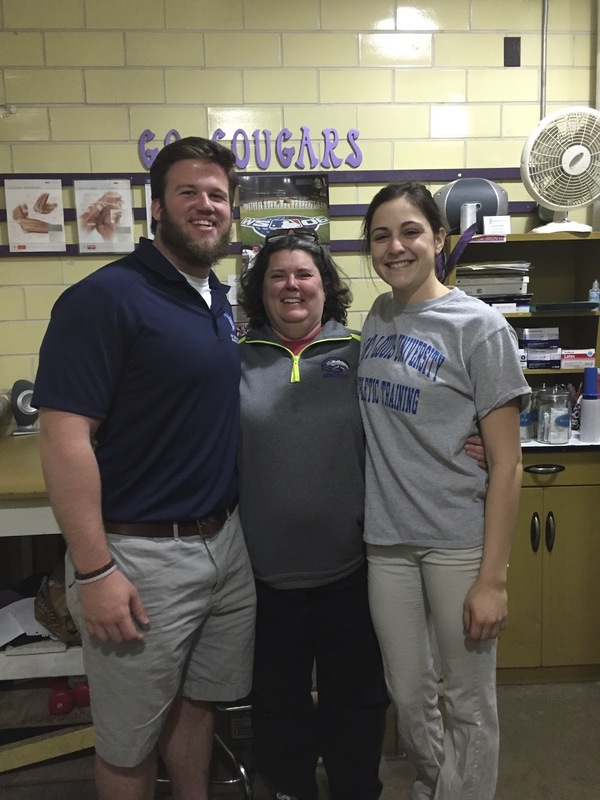 More often than not, I was able to attend Affton High School in order to observe Mada Hauck, whose preceptor is Becky Stigen ATC. This training room is small, and it gets crowded at times, but it showed me the best way to make use of one’s space, no matter how limited. Observing a high school, I saw multiple sports throughout the semester and therefore learned many injuries that are common with their respective sports. I also learned that it is important to be able to communicate to all types of people, whether they are shy or outgoing, in order to best get your information across to them. The sports I observed most were basketball and volleyball. While there were no major injuries that occurred during my time observing, I was able to see many preventative or rehabilitative methods for those who had chronic injuries, or multi-sport athletes who were just coming off of an injury from a previous sport and ended up carrying it over to their new sport. I also observed at a Parkway South High School. While at Parkway South, I observed Sarah and her preceptor Mike Tzianos ATC. Mike was a very active athletic trainer, as he moved around and rotated from sport to sport in order to check on people, although we spent most of our time in the wrestling room watching practice. Mike explained that we were spending most of the time in the wrestling room because of all the sports that were practicing that day, wrestling was the one that was most likely going to have some sort of injury compared to others. We did watch a short scrimmage between the junior varsity women’s basketball team and the varsity women’s basketball team. One of the more interesting things that occurred during this observation was when a male basketball player came into the training room with a peeling callus that was about twice the size of a half dollar bill. Mike simply took some toenail clippers and carefully cut off the dead skin in order to expose the new skin to air. This observation taught me to make sure to keep a watchful eye on the most high-risk sport when it comes to being an athletic trainer at a high school. Another time I observed Tim Howell EdD, ATC, CSCS at the Webster Groves Ice Rink for the college club hockey championship. There was one instance where a player slipped and crashed into the boards very hard, and Tim was initially waved over to check on him, but it was then concluded that it was nothing to worry about so he did not have to go check on the player at the bench. There was one player who had a finger cut open, and Tim checked to see if he had gotten stitches as instructed. This taught me to always follow up on previous injuries in order to make sure that the athlete is doing everything they are supposed to do in order to help the injury heal. I also observed Bailey Draheim and Tammy Pastor ATC for SLU athletics for two different sports. The first time I observed, I watched some track and field competitions. Not much happened at the meet, although we did learn how spine board an athlete out of the pit. While spine boards are seemingly becoming more and more unnecessary, it was still a very interesting learning experience, one that was reinforced a couple weeks later in class, as we learned how to spine board on flat ground. The second time I observed these two was for a tennis tournament. At this observation, Tammy talked about many injuries associated with tennis, as well as other overhand sports. She mentioned that many tennis players will have chronic wrist injuries. This site taught me that it is very important to understand the chronic injuries for any sport that I deal with as an athletic trainer since they will most often be the issues that arise in any athletes I might see.